Colonial Legacy is available in ebook here. Also available in print from Booktopia, Angus & Robertson, Amazon and Fishpond. Growing up as the coachman’s son at Ashford Manor, Matt Jones is never at ease with his place in the world. Everything he believes about himself is turned upside down when he discovers a well-kept secret. He travels to Australia in search of his birth parents and revels in the rugged lifestyle on their Central Queensland cattle run. But a jealous younger brother and a clandestine relationship with Isabella, an innocent neighbour, make for stormy undercurrents. Isabella is heartbroken when he leaves to try his luck at the goldfields. Matt’s family intervenes on Isabella’s behalf, but there is trouble and a near-tragedy in store for Matt. When he finally realises how much he loves Isabella, he fears it may be already too late. Previously published as A Hidden Legacy. Colonial Daughter is available in ebook here. It is also available in print from online retailers, including Fishpond, Booktopia, Barnes and Noble and Amazon. Rather than join her wealthy parents in England, rebellious Louise Ashford finds work as a governess in the frontier settlements of Central Queensland. She falls in love with Lloyd Kavanagh, a young cattleman of convict descent. But she knows Lloyd will never be accepted by her family. Their romance ends abruptly when her brother Charles intervenes, carrying her off to England. Charles’s lies ensure Lloyd will not try to follow her. More grief awaits her in England and a disgraced Louise seizes the chance to accompany Charles back to Australia. She must defy all that is safe and secure if she is to reclaim her love and rebuild the life she longs for. Colonial Daughter was previously published as The Cornstalk. 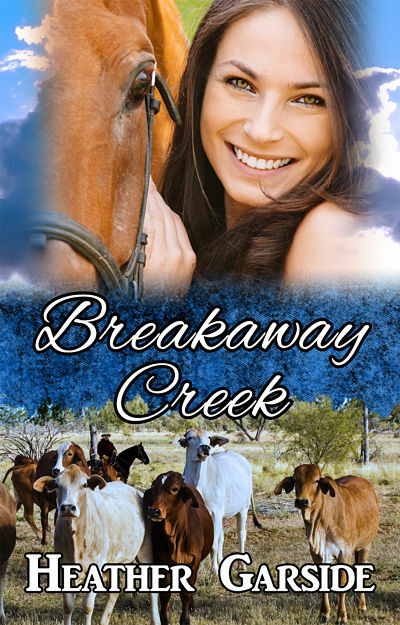 Breakaway Creek was released in print and eBook by Clan Destine Press in 2013. To buy, go to Clan Destine Press or contact me. Tracks of the Heart is a collection of three short rural romance stories, published by Clan Destine Press. It is also available from iBooks. Three short stories will take you on journeys of terror, heartbreak and a woman’s tentative struggles to reclaim her identity. Bushwhacked: Brittany’s quest for adventure on an isolated cattle station goes horribly wrong when she and Scott, the head stockman, are abducted on a lonely county road. Playing with Fire: Lisa is forced to revisit a tortured love affair when she recognises her companions on an outback train journey – an ill-fated family from her past. Coming Home: Kirsty leaves a destructive marriage to return to her parent’s cattle station, but has to contend with her father’s new manager – the boyfriend she deserted years before in favour of the city.